"Aa ja, aa ja, ja, ja"
"Først kommer fæl og fus"
"Herre! I staar saa stum!" "Hvad er her for Kommers?" "Fordum var der Fred paa Gaden"
"Hr. Leonard, Herrens tilkommende Svoger"
"Hov, Vægter! Klokken er slagen otte"
"Mellem Kande, Krus og Potte"
"Af Sted, af Sted, af Sted, af Sted!" "Herre! Herre! Kom kun frem"
"Men Herre, se som Venus steg af Havet"
"Se saa! Se saa! Nu er jeg ret bered"
Act 3: "Gaa af Vejen! Gaa af Vejen!" "At slig er Ungersvend i sin Tale"
"Hvis ej Jer Mine lyver slemt"
Carl Nielsen's vivid comedy opera ”Maskarade has enjoyed a natural status as Denmark's national opera ever since its first performance at the Royal Danish Opera in 1906. On this recording, Nielsen expert Michael Schønwandt leads a sparkling cast of today’s finest Nielsen singers and the Danish National Symphony Orchestra through the delightful yet stirring comedy plot. Recorded in the ideal acoustic of DR Koncerthuset, this is the 21st century’s first studio recording of Nielsen’s much-loved opera, appropriately released to celebrate the Danish composer’s 150th anniversary. "Alt føles rigtigt, og han kommer paletten rundt. Både det kradsbørstige og det poetiske sidder lige i øjet." "Throughout, Michael Schønwandt keeps an iron grip, particularly on the pacing of the sometimes quite complex interactions of soloists and choir. He also ensures that the many dances have rhythmic spring and lilt, and that there are plenty of major contrasts in both speed and dynamics as Nielsen’s score demands. The soloists are in top voice (...) Their comical mocking voices and sneering descriptions of character friends are well done and amusing. It is immediately obvious that the Danish National Symphony Orchestra and Choir are also fired up, keeping the listener in thrall throughout the three acts." "This exemplary new studio recording is a must-have… Here is a cast whose singing brings the comedy to life under the expert baton of Michael Schønwandt. Enjoy two hours of top-notch light music and brush up your Danish in the process." "As with Scriabin, Nielsen’s anniversary invites us to reassess the composer with new recordings, in this case a fourth—and successful—outing on disc for Maskarade." "This latest CD boasts probably the strongest cast on record so far. The mighty bass Stephen Milling catches the ageing paterfamilias Jeronimus’s comically fallible humanity likeably." *RECORDING OF THE MONTH* <br/> This is a wonderful set, which I thoroughly enjoyed. Offhand it’s hard to imagine a happier celebration of Nielsen’s 150th anniversary. "Die Sänger, die für diese Produktion engagiert wurden, bringen die Komödie auf hohem Niveau zu Leben und da auch Schoenwandt die leichte und spritzige Musik des Komponisten mit viel Sinn für den klugem Witz auf die höhere Qualitätsschiene hebt, ist alles vereint, um dem Hörer zwei vergängliche Stunden mit geistreicher, sprühender Musik zu garantieren." "Die Sänger, die für diese Produktion engagiert wurden, bringen die Komödie auf hohem Niveau zu Leben"
Nielsen for the modern age<br/>"Micheal Schønwandt conducts with great detail and sweep"
"...if you’re looking for a truly complete and compelling account of Maskarade this newcomer is the one to have... This gorgeous set confirms Michael Schønwandt as a Nielsen conductor of rare distinction; a <i>Maskarade</i> for the ages." "Denne udgaves virkelige trumfkort er Michael Schønwandt og det virtuost spillende DR Symfoniorkestret"
"The singing on this Dacapo set is just fabulous; it’s consistently accurate and imaginative… This gorgeous set confirms Michael Schønwandt as a Nielsen conductor of rare distinction; a Maskarade for the ages." "Cast, conductor and orchestra relish every bar"
"When played and sung like this, by a cast, conductor and orchestra who clearly relish every bar, it is hard not to be swept along by the warmth and generosity of spirit of the music…"
"Vom Danish National Symphony Orchestra unter der Leitung von Michael Schønwandt liegt nun das Werk des dänischen Nationalkomponisten in einer im vergangenen Jahr entstandenen beachtenswerten Einspielung vor..."
"Det er blevet en helt rigtig Maskarade til tiden"
<b>THE SPECIALIST’S GUIDE TO… Nielsen beyond the symphonies</b></br></br> "Few works underscore Nielsen’s desire to overturn the old order better than this, a snapshot from 1906 of a changing Denmark that advocates art for all and freedom in youth. It’s full of marvellous tunes and orchestral joie de vivre, particularly in this new recording. Not many composers can tread the line between profundity and froth, but Nielsen does so deliciously even when the opera collapses into a cavalcade of partying." "La baguette alerte et subtile de Michael Schønwandt est aussi à l’aise dans le ton XVIIIe que dans la veine populair." "…interesting, enjoyable and worth investigating"
"Maskarade, a lasting cornerstone within Danish culture"
"(...) Und für die jüngste Einspielung der Maskarade sind es erneut Chor und Nationalorchester, die unter der federnden, buffoleichten und temperamentvollen Leitung von Michael Schønwandt diese melodiös funkelnde, vor witzigen tonsetzerischen Einfällen nur so sprühende Opernrarität für das dänische Label Dacapo aufgenommen haben. Entstanden ist eine Einspielung, die rundum überzeugt..."
"With the excellence of the cast, completely delightful and engaging, plus the radiant playing of the DNSO under Michael Schonwandt in sound that is state of the art and wonderfully balanced, this is simply the recording to own." "Nielsen&rsquo;s seminal operatic masterpiece gets the recording it deserves, excellent on all fronts." "Well sung and interpreted as here, Maskarade deserves to be much more widely known." "Chorus and orchestra are incontestably authoritative. The sound is superbly vivid. As I have said before, jaded opera lovers, who think there are no new discoveries to be had, should rush to secure this recording while it lasts. It, and the work itself, are irresistible!" "Man hört einfach gerne wahnsinnig gerne zu. Selbst der dänischen Sprache!" "Brillieren kann vor allem Johan Reuter, als Heldenbariton gegenwärtig einer der Großen Europas"
"Aa ja, aa ja, ja, ja" 8:05 9,60 kr. "Først kommer fæl og fus" 3:33 6,40 kr. "Herre! I staar saa stum!" 2:41 6,40 kr. "Er der nogen hjemme?" 4:47 6,40 kr. "Hvad er her for Kommers?" 5:37 9,60 kr. "Det Satans Spind!" 1:15 6,40 kr. "Fordum var der Fred paa Gaden" 2:29 6,40 kr. "Hr. Leonard, Herrens tilkommende Svoger" 3:28 6,40 kr. "Her er jeg, Husbond" 2:25 6,40 kr. "I dette Land" 6:29 9,60 kr. "hans Datter ægte" 4:27 6,40 kr. Act 2: Prelude 4:33 6,40 kr. "Hov, Vægter! Klokken er slagen otte" 3:32 6,40 kr. "Mellem Kande, Krus og Potte" 1:41 6,40 kr. "Ha-a-a! Ha-a-a! Ha!" 3:34 6,40 kr. "Af Sted, af Sted, af Sted, af Sted!" 4:24 6,40 kr. "Herre! Herre! Kom kun frem" 3:05 6,40 kr. "Men Herre, se som Venus steg af Havet" 6:57 9,60 kr. "Hør et Ord Kavaler" 1:07 6,40 kr. "Luk op! Luk op!" 2:53 6,40 kr. "Porten er aaben!" 2:19 6,40 kr. "Se saa! Se saa! Nu er jeg ret bered" 4:39 6,40 kr. Act 3: "Gaa af Vejen! Gaa af Vejen!" 2:46 6,40 kr. "Studenter! Studenter! Studenter!" 4:40 6,40 kr. "At slig er Ungersvend i sin Tale" 1:54 6,40 kr. "Ulignelige Pige" 4:27 6,40 kr. "Min søde Balsambøsse!" 1:52 6,40 kr. "Ydmygste Tjener, Madam!" 4:02 6,40 kr. Hanedansen (Dance of the Cockerel) 5:34 9,60 kr. "O, kom min Ven!" 1:40 6,40 kr. "Hvis ej Jer Mine lyver slemt" 6:02 9,60 kr. "Gør Plads! Gør Plads!" 5:33 9,60 kr. "Hvor Bacchus er" 4:14 6,40 kr. "Du er min Ven" 5:28 9,60 kr. "Tramtrara! Tramtrara!" 6:26 9,60 kr. "Kehraus! Kehraus!" 2:19 6,40 kr. Carl Nielsen more or less defined the nature of the Danish song. In a wealth of songs that are known and sung by well nigh all Danes, he forged a tone that seems always to have been present in shared Danish consciousness. And Maskarade builds a unique bridge between popular and elite art. Its language hits off the Danish tone exactly: at once very straightforward, colloquial, full of typical quick Danish wit, and sophisticated. Hearing Jeronimus´ central song “Fordum var der fred på gaden” (Time was when our street was silent) is just like hearing one of Carl Nielsen’s innumerable Danish songs. But on closer scrutiny it turns out to be much more demanding to sing, with a compass of over one and a half octaves! It would never do as a community song! For me there is no doubt that Carl Nielsen drew inspiration for Maskarade from Falstaff and The Mastersingers of Nuremberg – two operas he himself had played in as a violinist in the Royal Danish Orchestra at the Royal Danish Theatre. As in the two operas, the orchestra fizzles with witty comments on the action all the way through, but the musical idiom is quite unmistakably Carl Nielsen’s. Maskarade has in fact followed me all my life. I got to know the opera when I was ten, and quickly learned every note by heart. I see that knowledge and love as a challenge to shed new light on the score every single time, in close collaboration with the director and not least the cast and musicians with their knowledge and artistic awareness. For over a century Maskarade has been Denmark’s national opera. And when as in this case it is performed by a scintillating array of the foremost Danish singers in 2015, you clearly sense the generations of accumulated knowledge and love of Maskarade. May its wealth of joie de vivre continue to pay tribute to love and the inextinguishable life force! As early as the beginning of the 1890s the then newly-employed violinist in the Royal Danish Orchestra Carl Nielsen (1865-1931) was playing with the idea of writing an opera on the basis of Ludvig Holberg’s comedy Mascaraden (The Masquerade). However, Nielsen abandoned the idea again, and his first opera, Saul and David, was instead based on the Old Testament. It was premiered at the Royal Theatre in 1902. But Nielsen had not forgotten the idea of a Holberg-based opera. At first he tried out a plot based on Holberg’s Kilderejsen (The Healing Spring). He quickly rejected this idea in favour of Mascaraden, which had been performed in Holberg’s time at the Theatre in Lille Grønnegade (the precursor of the Royal Theatre). This comedy had last been performed at the Royal Theatre in the 1896-97 season, so many Copenhagen theatre-goers would still have a vivid recollection of it. This made the choice of a librettist all the more crucial. Nielsen thought he had found the solution to the problem one evening at a production mounted by the University at Folketeatret, when Wilhelm Andersen, who was performing in the production, caught his eye. A contemporary of Nielsen’s, Andersen (1864-1953) had his credentials in order as the winner of the Copenhagen University Gold Medal in 1891, and Nielsen now visited him with his Holberg ideas under his arm. Nielsen had the libretto in his possession from the spring of 1904, but only started composing around New Year 1904-05. Since April 1904 Nielsen had been acting as deputy conductor at the Royal Theatre, but in March 1905 he was informed that as of the following season he was to be back in his post in the second-violin group of the Royal Orchestra. Nielsen had no desire to do this and therefore stepped down at the end of the 1904/05 season. The 1908/09 season, however, saw him back again, now as the Theatre’s Assistant Conductor (and once again with the opportunity to conduct Maskarade, now as an engaged conductor, not as the composer of the work). Since mid-November Nielsen’s wife, the sculptress Anne Marie Carl-Nielsen, had been in Athens to continue her work of copying ancient sculptures at the Acropolis Museum. Her long absence was stressful to both her husband and the three children, and around 1 April 1905, after increasingly desperate letters from Carl, Anne Marie had to return with all haste to Copenhagen to unravel the compli­cations that had arisen. After this, the composition work could begin again. At first, for Nielsen, it was a matter of delivering the first act to the Royal Theatre, so the new opera could be approved for performance in the 1905-06 season. The ink fair copy for the first act was to be ready before the end of the season on 31 May 1905, and Nielsen managed this. On the other hand, for the Theatre’s next deadline, 9 October 1905, when he was supposed to deliver the whole opera, he had to hastily compose some powerful final chords and hope that old Johan Svendsen, who had been principal conductor at the Royal Theatre for many years, would not discover that the opera was in fact not yet fully composed, or that he would perhaps turn a blind eye. He had always been kindly disposed to Nielsen. And indeed Svendsen accepted the new Holberg opera with his vote. The Theatre’s textual censor, Otto Borchsenius, was extremely negative about Vilhelm Andersen’s text, but fortunately declared himself willing to bow to Johan Svendsen’s positive vote. Various practical matters made it necessary to defer the premiere to 11 November 1906, and Nielsen used the time right to the end: the overture, which like the overture to Mozart’s Don Giovanni, continues without a break into the first act of the opera, was finished six days before the premiere, and afterwards Nielsen composed a further song for Leonora’s maidservant Pernille in the second act of the opera. This figure had not been given as clear a profile as her male counterpart, Leander’s servant Henrik. For at Nielsen’s request Andersen had given Henrik a rebellious spirit, which in truth was more appropriate to the period around the Revolution in Paris in 1789 than to Holberg’s epoch half a century earlier. 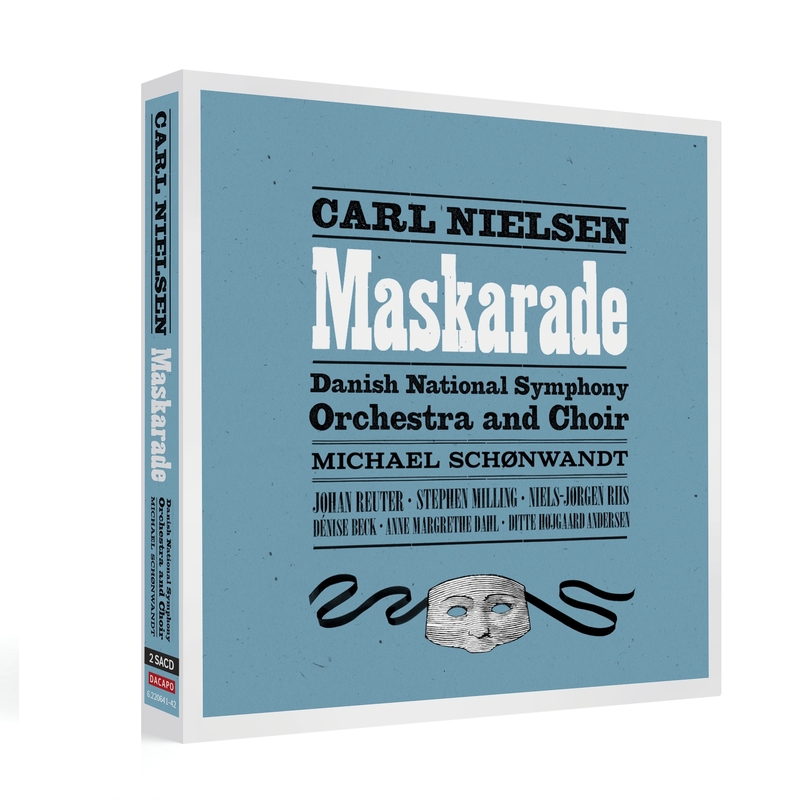 The recording presented here includes the whole of Nielsen’s Maskarade score. But already during the rehearsals for the world premiere Nielsen had to agree to tighten up Act Three with three minor cuts. The cast included not only a number of the Theatre’s singers, but also some of its best singing actors, including such excellent character actors as Karl Mantzius (1860-1921) as Jeronimus and Jonna Neiiendam (1872-1938) as his wife Magdelone. In the mainly positive reviews the first act of the opera was emphasized as particularly successful. So in the end was it Holberg’s comedy or Nielsen’s opera that in the long run won the favour of the Copenhagen public? The Holberg comedy was performed again a few times in the 1914/15 and 1915/16 seasons, but no more during Nielsen’s lifetime. Up until the 1929/30 season the opera in its original staging saw a total of 59 performances under a succession of conductors, including Nielsen himself, and with a few varying cuts in the second and third act. In 1931 the opera was to be restaged, still in the original scenery, but with a new director, Poul Wiedemann, and a new conductor, the Italian Egisto Tango. On the opening evening, 26 September, Nielsen was clearly troubled by the heart problems which had in fact plagued him for years, on and off. This time, though, it turned out to be more serious. On 1 October he had to be admitted in haste to the Copenhagen University Hospital, where he briefly woke up for the last time at 10 pm the next day. His death occurred around ten minutes after midnight on 3 October. Nielsen had been helpful right to the end. Jonna Neiiendam was still sche­duled to sing Magdelone in the new 1931 production. Nielsen had noticed that during the rehearsals she now seemed to be having trouble with the little solo in Act Two when the game old lady has to sneak across the street to the Masquerade. Ten days before the opening night he had therefore sent her a carefully revised version of the solo that would quietly help her out of her torment. Is this not exactly how old friends can help one another in their time of need?